Full-height windows set into the angled facades of this summer house provide views of the Swedish archipelago from a living space and two adjoining bedroom wings. 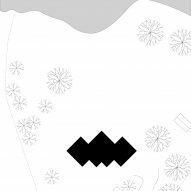 Villa G was designed by architect André Pihl to replace an existing 1960s cottage on the site, which is located in a quiet bay in the southeastern region of the archipelago. The site's western boundary faces the coastline and provides the house with a view towards the southern horizon of the Baltic Sea. 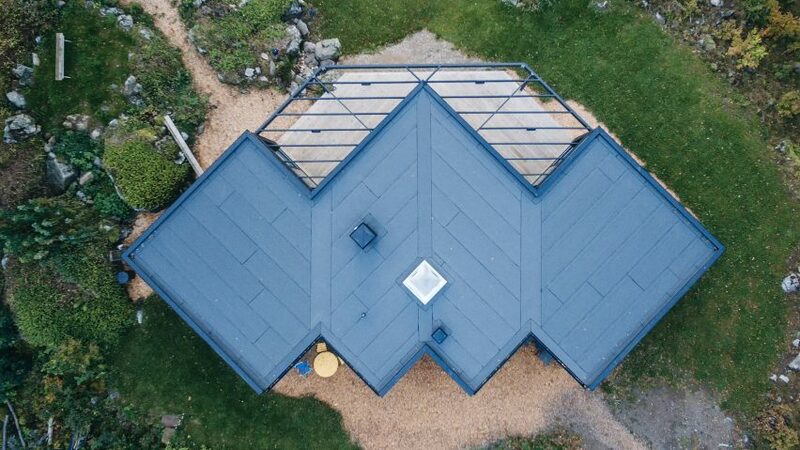 The new house is aligned with the centre of the previous building and is orientated to take advantage of the views, as well as ensuring sight lines from the neighbouring property are not obstructed. The architect describes the building as "bat-shaped" due to its unusual plan, which comprises three interlocking diamond-shaped volumes. The central form contains a living room and kitchen incorporating a built-in sofa and a spherical antique fireplace salvaged from the old summer house. 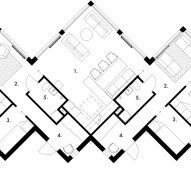 On either side of this communal space are private wings containing bedrooms, bathrooms and small lounge areas. "The house's form is derived to maximise the vast ocean view while simultaneously embracing an intimacy with the nature on site," said Pihl. Each wing has its own entrance and is connected with the main living space by a sliding door. On the sea-facing side, the private areas and central room all open onto a decked terrace. 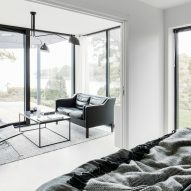 The bedrooms can be opened up to their individual lounges by retracting double sliding doors, while another layer of glazed doors provides sea views from the beds and direct access to the terrace. A sloping driveway ascends towards the side of the house facing the forest. 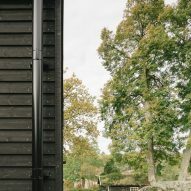 These surfaces are entirely clad in horizontal timber boards that are stained black to evoke the original summer house. The pared-back facade complements its natural surroundings and incorporates tall, narrow windows that frame specific views. A gravel-covered terrace extending around the edge of the building provides a place to catch the morning sun. The house's interior features a minimal, monochrome material palette designed to create a refined and calming ambience. The spaces are flooded with natural light from the glazed doors and a skylight above the kitchen. White walls and a polished-concrete floor provide a neutral backdrop for furniture with varying tones and textures, and occasional brightly coloured accents. Photography is by André Pihl.